6 Drawer Cart with Sharps Container Holder, 12-Bin Organizer with Accessory Bridge, Catheter Holder, Waste Bin and two Accessory Rails. 5 Drawer Cart with Sharps Container Holder, 12-Bin Organizer with Accessory Bridge, Catheter Holder, Waste Bin and two Accessory Rails. 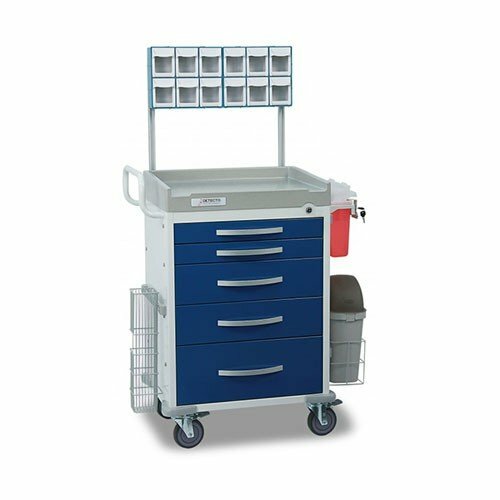 RESCUE Medical Anesthesiology Carts, by Detecto, are quality, medical-grade medical carts that are designed with a medical-grade powder-coat blue paint exterior to distinguish its designation for anesthesiology departments, available with either five or six drawers. Manufactured from Detecto's quality aluminum cart body construction that is powder-coat painted for durability with ABS countertops that are easy to clean, and 360-degree rotation design for tight corners. Furthermore, the deluxe editions come with a IV pole, defibrillator shelf, cardiac board, oxygen tank holder, sharps container holder and Two Accessory Rails. RESCUE Medical Anesthesiology Carts feature keyed or EMG breakaway central locks that are designed to secure all the drawers at the same time for added convenience. The cart's 5-inch-diameter wheels feature two parking locks and one steering lock. ABS bumpers protect all four corners or the medical carts. With its push-handle design, the RESCUE Medical Carts offer a completely user-friendly design. Vitality Medical also carries Detecto's WHISPER Medical Anesthesiology Cart, as well as other storage items, such as the Bergan Smart Storage. 2 Parking Locks and 1 Steering Lock on Wheels. 360-Degree Rotation for Tight Corners. ABS Bumpers on All 4 Corners. Available in 5- or 6- Drawer Models. Balanced Design Will Not Topple Over. Completely-Sealed Drawers with No Exposed Seams. Interior Wall Insulation for Quiet Ride. Keyed or EMG Breakaway Lock Secures All Drawers. Removable Drawer Facades for Hygienic Cleaning. Included Accessories with Deluxe Editions: IV Pole, Defibrillator Shelf, Cardiac Board, Oxygen Tank Holder, Sharps Container Holder and Two Accessory Rails. 2 Parking Locks and 1 Directional Steering Lock.